My husband and I did a lot of research before going to Thailand reading travel books from the library and watching a ton of YouTube videos by trekkers. 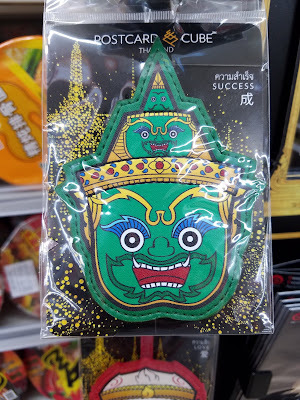 We learned the most when we were ACTUALLY in Thailand, also known as the Land of Smiles. Buy a SIM CARD - it costs about 20 US dollars and it's very useful. Make sure your phone is unlocked so the sim card will work. We used our phone for GPS, hailing Grab taxis, Mobile Hotspot, and researching places we wanted to visit. BARGAIN, BARGAIN BARGAIN!!! Try your hand at negotiating when buying souvenirs, handicrafts, or fruits at street markets. If you are going to buy multiple items, there's more room for bargaining. It doesn't hurt and you can save some $$$. 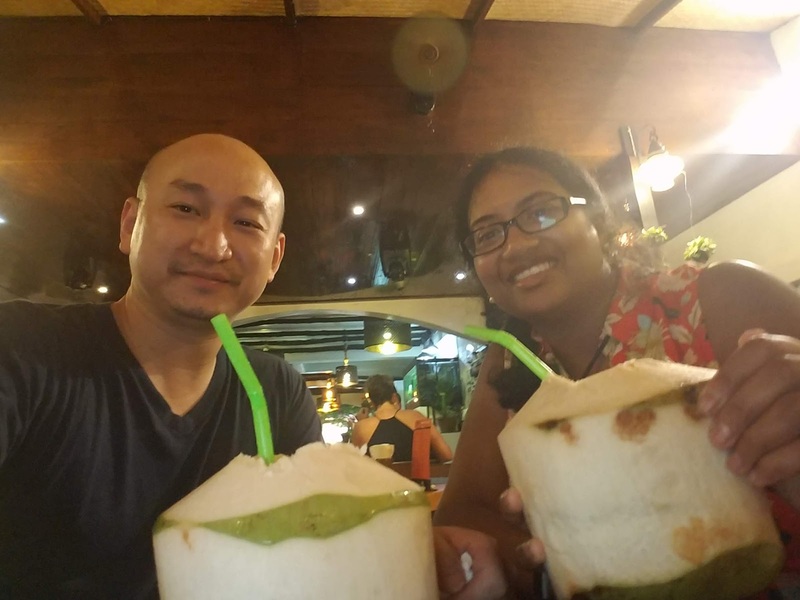 We were at the Fisherman's village night market in Koh Samui and got lucky with a vendor who was selling the intricately painted coconut shells. It was about to rain and he wanted to make a sale, so he agreed to my price. Lucky me!! SHOP AROUND/ COMPARE PRICES when booking tours, renting scooters or even getting a massage. These vendors are dime a dozen and prices vary. Khaosan Spa in Bangkok was really good. They were the only ones who washed our feet before massaging them. Hygene is a plus! Stay hydrated; always carry bottled water with you when you go out on day trips. We actually bought a gallon water jug and refilled our bottles if we stayed in a hotel that didn't replenish the water bottles daily. Take a Cooking Class! There are dime a dozen cooking schools in Chiang Mai. We picked one that provided transportation to and from our hotel and of course a school with lots of good reviews. We took a half day class at Asia Scenic Cooking School located on 31 Rachadumneon Soi 5, Chiang Mai 50200, Thailand. It's woman owned and the teachers are all knowledgeable, funny, and great. We enjoyed our class a lot!! This is a good spot. We are enjoying the fruits of our labor with our group. 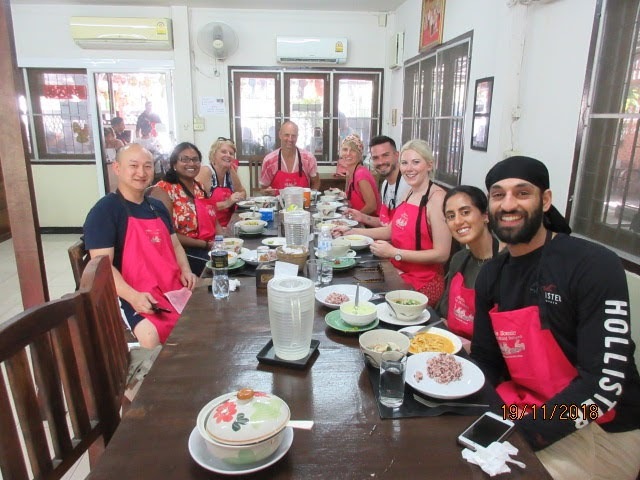 We had so much fun learning to cook Thai food. Check out 7-Eleven: It is everywhere i.e. Dunkin Donuts or Starbucks at every corner in NYC. We bought water, soft drinks, hot sandwiches, snacks, flip flops, and even stamps to send postcards to the US (it costs 15 baht). Explore your palate. Thai cuisine is diverse and quite flavorful. I was surprised to learned that tamarind and palm sugar are used in making Pad Thai. We really enjoyed the cuisine. Check out our foodie pictures on our Instagram page . Be vary of the Tuk Tuk Mafia! Our tour guide at Grand Palace told us to be aware of the tuk tuk drivers. They may try to cheat you or give you high fare rates for your destinations. We used our Grab app to navigate when we took a tuk tuk to get around. We used the Grab app to negotiate the fares with the tuk tuk drivers. Short shorts or bikinis aren't allowed everywhere. 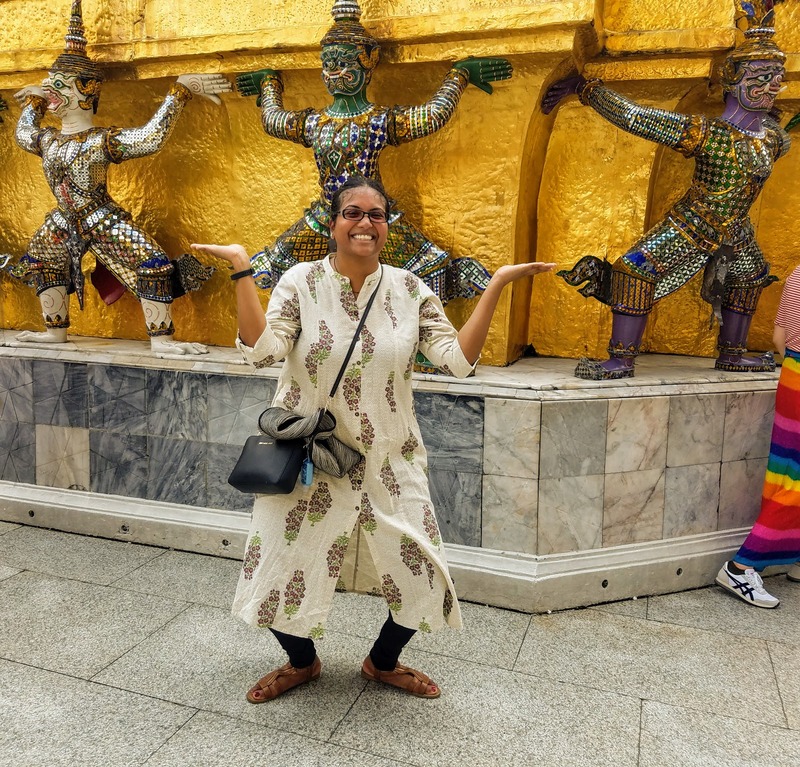 There are strict dress codes at places like the Grand Palace (where the Jade Buddha resides) and Wat Pho (where the reclining Buddha resides). Tourists who do not adhere to the dress code, are asked to rent or buy clothing to cover up inside the sights. I'm so glad I packed a kurti and tights. I didn't have to change my attire at the Grand Palace. In Bangkok: we used Grab Taxi (download app; compatible for iPhone and Android). We were able to track our driver's movements until he came to pick us up. 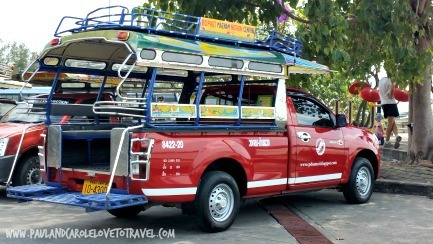 In Koh Samui and Chiang Mai: we hailed Songthaews like the one above to get around everywhere; they do not cost much. You will see these driving around all over the city or island. 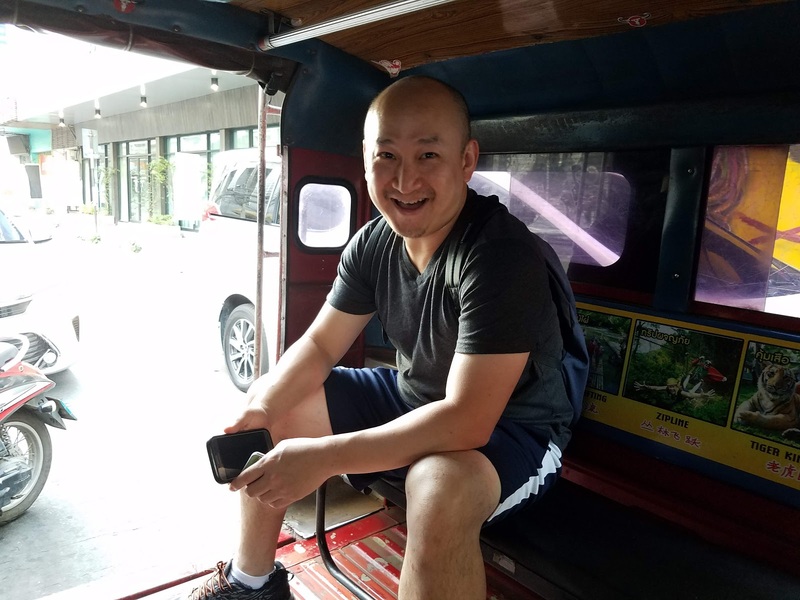 My husband, Michael, is trying to enjoy our ride in a Songthaew to the night market in Chiang Mai. It feels like you're sitting in the back of a pick up truck with a roof. Not the most comfortable! You can rent scooters as well but make sure you know how to drive one and get one that's at least 150cc for climbing steep hills/roads. Make copies of the first page in your passport. All of the transportation vendors ask for your passport as leverage; a copy works just as well. 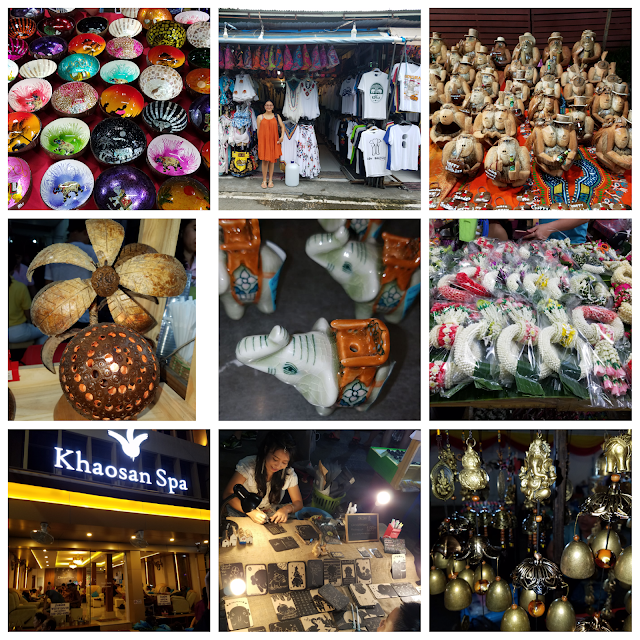 Overall, we really enjoyed our time in Thailand and I am looking forward to going there again in the future. Until then, tata! Happy New Year everyone! I can't believe it's 2019 already. It's been over a year since I got married and settled down in my "new life". 2019 - Is a new year of opportunities, possibilities, and of course recipes. We're starting the year off with a fun snack that is not only for children anymore. In fact, adults may jump up for joy for this snack as it's crunchy and has a bit of kick to every bite. 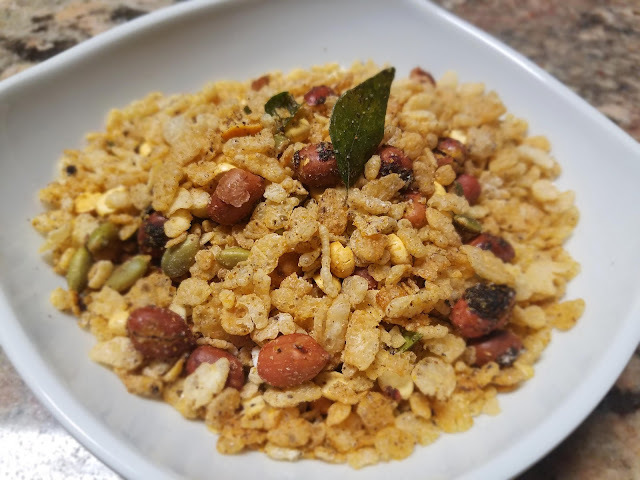 We had so much fun making Indian snacks with corn flakes (corn flakes mixture), that we wanted to make more snacks with other cereals like such as Rice Krispies cereal. 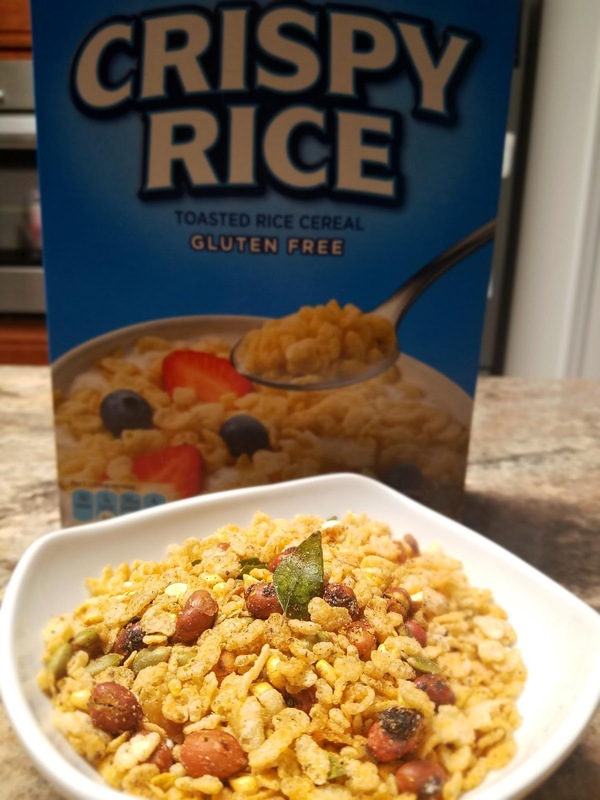 You can use Kellogg's Rice Krispies cereal or a generic brand. This snack mix is simple and easy to make. We took an ordinary cereal and kicked it up a notch with some spices. 1) Heat oil in a saucepan on medium heat. Fry the peanuts and then add chili powder, dhanjeera powder and fry the mixture for 15 seconds. Next, add curry leaves and fry until they are crisp. Then, add citric acid and salt and mix well for another few seconds. 2) Transfer the rice crispies into a large microwaveable bowl, and then, add roasted chana dal, pumpkin seeds and all the fried ingredients. Mix well and microwave for 4 to 5 minutes based on the microwave oven power in 2 minute intervals mixing intermittently. Adjust salt and chili powder if needed and microwave for another minute. Sprinkle the chat masala and mix well. 3) Allow the mixture to cool down for 10 minutes.The mixture is ready to serve. Enjoy on its own or with your favorite beverage.